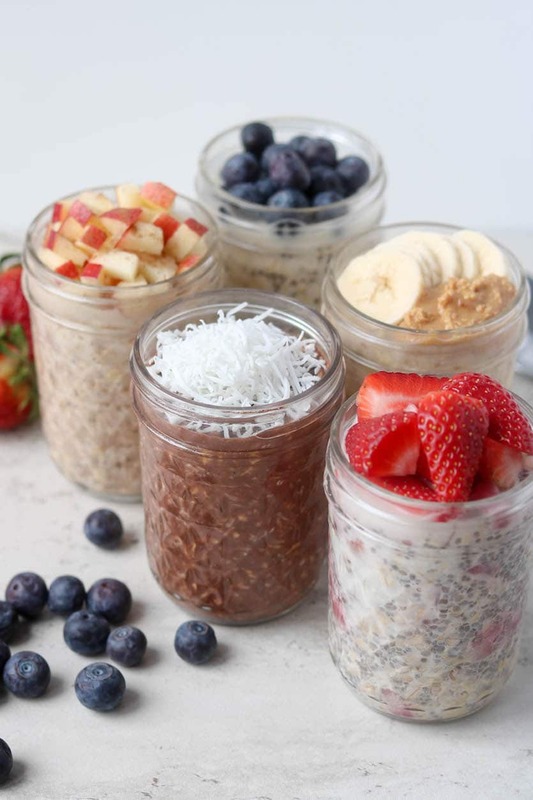 Overnight oats are a simple and delicious way to make sure you get a healthy breakfast no matter how busy your morning is! Made in under 5 minutes, overnight oats are the perfect grab-and-go morning meal. Oatmeal: Used rolled oats or quick cooking oats for the best results. Steel cut oatmeal is far too tough for overnight oats and won’t soften in the liquid to give you a good texture. Milk of Choice: You can really use any type of milk you like in your overnight oats, my personal favorites are almond milk and coconut milk, but regular cow’s milk, cashew milk, rice milk or any other milk work just as well! I don’t recommend using water because the flavour won’t be as good. 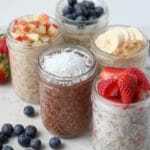 Sea Salt: A little pinch of sea salt goes a very long way when making a batch of overnight oats. Just a little sprinkle helps to bring out the flavor of your seasonings and helps to breakdown the oatmeal for a softer texture. Thickeners: I like to add a little something to help tie the oats and liquid together to enhance it with a thicker texture. Things like chia seeds, ground flax or plain yogurt work really well for this. Flavours: This is where you can have a lot of fun! Essentially any type of sweet spice (ie – cinnamon, nutmeg, ginger, cocoa powder, etc…) will work well in overnight oats, as well as things like nut butter and vanilla extract. Fruit: Once you have a base formed, you can add different types of fruit for extra flavour and added sweetness. Fresh or frozen work equally well, and you can add them the night before or top your overnight oats in the morning if you prefer. Sweeteners: Natural sweeteners like honey or maple syrup are totally optional, and just a little drizzle goes a long way especially if you’ve added fruit and lots of flavour. I’m sharing 5 of my personal favourite overnight oat recipes below, but once you get the hang of it the world is your oyster for endless possibilities of overnight oats! I find the best ratio for overnight oats to be 1/2 cup oats to 3/4 cup liquid, and once you’ve got that down you can flavour them any way you like. I sweetened these versions lightly, but feel free to add an extra drizzle of natural sweetener in the morning or omit it all together if you want a low sugar option. In a small mason jar or container, add all of the dry ingredients and stir to combine, and then add fruit (if required). Add in milk of your choice and stir or shake mason jar to ensure everything is well combined. Cover with a lid and transfer to the fridge overnight. Remove and top with additional fruit to serve (if desired). Hey Steph – these look amazing! Out of curiosity, have you ever warmed overnight oats up in the microwave before eating? I’m more of a warm breakfast gal. Thank you! !